Just over a year after their debut with the original musical Ragtime Women, featuring little known Ragtime gems by female composers, Theatre Elision closes their first full season with another original musical. 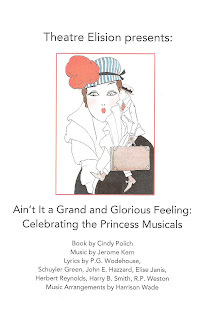 In Ain't It a Grand and Glorious Feeling: Celebrating the Princess Musicals, book writer and Theatre Elision founder Cindy Polich weaves a modern rom-com around the songs of Jerome Kern from a handful of musicals written for NYC's Princess Theatre in the early 20th Century. We get to re-discover these lovely and clever songs from one of the most important musical theater composers of the last century, while enjoying a charming modern story set in a coffee shop, that takes place in an actual coffee shop! For less than $40, you can get a delicious meal, dessert, coffee, and see the show. It's a wonderful way to end their successful season of a repertoire of shows that fill a niche I didn't even realize was missing until Elision appeared on the #TCTheater scene: small cast, intimate, original or rarely done musicals with a focus on female cast and creative team. Typically they have super short runs, just one weekend, but Grand and Glorious is playing two weekends, so you have time to get out and experience this fun, intimate, site-specific, musically delicious little show. And after you do, you'll surely want to put their six-show second season on your calendar, featuring the return of a few favorites from the first season, another original work, and a US premiere. 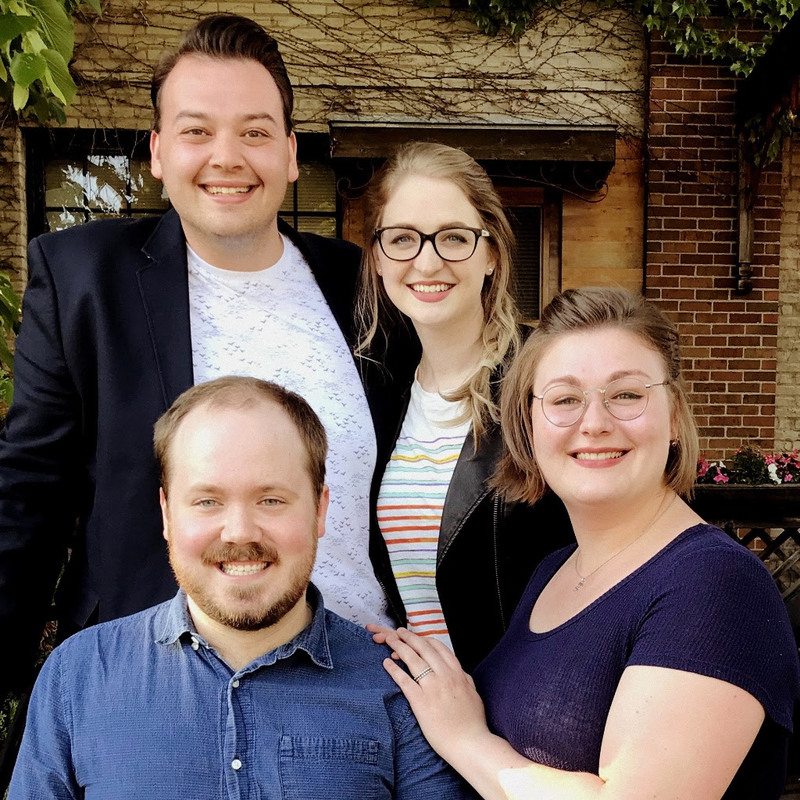 This four-person musical features two couples (played by Abilene Olson, Carl Swanson, Tim Beeckman Davis, and Christine Wade, who also serves as vocal director), and tells the story of how each met and fell in love. Jessica introduces her friend Ashley to her old college pal Matt, who then introduces her to his buddy Michael. The two courtships play out over about 20 songs, in a typically fast love-at-first-sight kind of way (it is a muuuusical after all, and only a 90-minute one at that). The songs are well chosen and arranged within the book so that they flow seamlessly and make sense as a story. The challenging thing is to make these songs about love that were "meaningful, modern, sophisticated" 100 years ago, but are a bit dated now, work in a modern story. And for the most part they do. Ashley is one of those girls who dreams about getting married, so she gets the more dopey songs. But Jessica is a feminist (gasp!) and falls a little more reluctantly, which is a necessary balance. The show is well staged by director Lindsay Redman, with the cast utilizing all parts of the coffee shop, sitting at tables, going up to the counter, and exiting through both doors. Much of the action takes place in the center tables, so I would recommend sitting on the outside walls facing in. Texts between the friends are displayed on a screen (a la Jane the Virgin) which is a clever and modern way of storytelling (although I wish there were screens on both sides of the room to make viewing more convenient). The sounds is great in the small space of the coffee shop, but I don't know why the actors have to be miked, maybe there's something going on with the acoustics of the room. I always prefer unmiked if possible, especially when the actors are literally standing or sitting right next to you. And these four all have strong, powerful, beautiful voices that don't need amplification. But the music sounds great, and I found these songs (none of which I recognized) to be really lovely melodies with clever lyrics (with a few new up-to-date lyrics added), accompanied by music director Harrison Wade (who gets to say one of the funniest and most clever lines in the show). It's a great time for site-specific theater right now, with the lack of performance space forcing theaters to get creative (neccesity is the mother of invention, after all): last month we had Minneapolis Musical Theater's High Fidelity ingeniously staged in the iconic record store Electric Fetus, Uprising Theatre Company is staging a play that takes place in a prison kitchen in an actual kitchen (although not an actual prison, Apples in Winter now playing), and now a coffee shop rom-com staged in a coffee shop. Not much makes me happier than eating apple pie and drinking coffee while watching a new original musical. And yes, the songs and story do contain some stereotypical heterosexual gender norms, but these charming if dated old gems have been freshened up enough to make them palatable, and even enjoyable, for a modern audience. Check out Theatre Elision at Mojo Coffee Gallery* (a cool spot that combines art with a cafe) in Northeast Minneapolis through June 10, and experience some unique, intimate, original, delicious musical theater (click here for info and tickets). *A note about location. The address for Mojo Coffee Gallery is 2205 California Street, but the entrance is actually around the corner on 22nd, where there's a parking lot. Enter on the east side of the building.